With the initial phase of Beyond this Brief Anomaly’s inquiry complete, we now have in place the basic foundations that we’ll need for exploring our contemporary human situation from an energetic perspective. There’s much scope for introducing further technical detail—the physics and engineering perspective if you like—and we’ll certainly need that if we’re to develop the kind of energy literacy that I think will be beneficial in navigating the societal challenges and dilemmas we face. From here on in though, I’ll try to situate that in the context of the immediate questions that might be prudent for us, as a collective humanity, to consider as we work out how we’re going to live together on this physically finite and rather precious planet of ours. It will come as no great surprise that I regard some of the most important questions we face as having energetic dimensions. In fact, draw the boundary wide enough—and in most cases, “wide enough” is not all that far—and questions around how we source our energy, and what we do with the energy so sourced, have critical implications for every significant challenge that confronts us. This is a straightforward entailment of the way that, as we’ve seen over the past couple of months, the energy concept relates to how we understand any situation in terms of its most fundamental physical aspects. Roughly speaking, the greater the scale of physical activity associated with any situation we’re dealing with—or on which that situation is itself dependent—the more likely it is that we’ll need to come to terms with its energetics. And given the nature of our principal energy sources, the longer the characteristic time horizon associated with any situation of interest, the more important its energetic aspects become. This is our starting point for today’s post, which in turn is intended to set the scene for the next inquiry phase. We’ll spend the remainder of this post unpacking these statements and getting some sense of the message they’re intended to convey. Along the way, this will raise a number of more general conceptual issues also, and I’ll deal with these as they come up. Firstly, we should note that these figures don’t in fact provide the whole energetic story of human activity in 2009. Omitted from this view is energy provided to us by the food that we eat—i.e. the food energy sources that enable our own metabolic processes, for which the original energy source is direct solar radiation, converted to chemical energy in plants by photosynthesis (the energy required for our food’s farming, processing, packaging, transport, retail and so on is included though). Also omitted is the energy that we access directly from our immediate environment, for instance solar radiation that provides passive heating of buildings or that’s used for drying clothes. The inclusions in the data are essentially those energy sources that are tradeable and hence subject to some form of economic transaction. That is, they are recognised in national accounts as being included in the formal economy. Definitions for the full range of inclusions are available here. For reference, the multiplier 1018 is exa, E; in plain language, “a billion billion”. So we can say that in 2009, total world energy production was approximately 515 exa joules, or 515 billion billion joules. We can now move on to look at just what each of these three quantities relates to. The terms “energy” and “production” as they’re used here need a little clarification, and in turn highlight the way in which conventions in terminology can become a significant source of confusion. What we’re running into here is in effect a misalignment at the conceptual interface between the natural sciences, and the social science of economics. Adoption of the term “production” in this context reflects a perspective from resource economics, rather than a perspective based on the underlying physics. In economic parlance, it’s conventional to talk about production of natural resources. Production in this sense has the very specific meaning of converting a substance with recognised value from a state in which it occurs naturally to a form suitable for input to economic processes. So for instance, we say that coal is produced from naturally-occurring deposits in order to make it available for sale, or for direct use in electricity generation and for other industrial purposes. In this sense, to produce a resource does not mean to “create it from more basic components”. This is particularly significant in relation to energy resources. A principal entailment of energy law 1, the conservation law, is that the energy associated with a system is neither created nor destroyed. In other words, energy is neither produced nor consumed—it is simply converted from one form to another. Nonetheless, as a system’s energy is converted between forms, it spreads out, and in doing so its capacity to bring about further changes in the system’s surrounds can be said to be used up. Following energy law 2, we can make use of its propensity to spread out from higher to lower concentrations as it is converted between forms, and in doing so we deplete its capacity to spread out further. A basic illustrative example: the chemical energy associated with coal is converted to thermal energy of the combustion products and surrounds when coal is burnt in air, spreading out in the process. As this dispersal proceeds, some of the thermal energy can heat a working fluid in a boiler, increasing the thermal energy of the fluid; the fluid’s thermal energy can then be converted to bulk mechanical energy as the gaseous fluid expands, and this can in turn be converted to the rotary mechanical energy of a turbine; the turbine’s mechanical energy can be converted to electrical energy via a generator. Each of these conversions utilises the dispersal tendency associated with the energy, and each depletes the capacity for further dispersal. On this basis, it’s more appropriate to speak of energy supply and use, rather than “production and consumption”, unless it’s clear that what we in fact have in mind is production or consumption of energy sources, rather than the energy associated with those sources. At first glance my insistence in this particular context on talking about energy supply and use rather than production and consumption may seem to be a rather esoteric point, without clear practical implications. I’ll be arguing (and attempting to show) as we proceed though that this is far from the case—and that this distinction in fact has highly practical entailments. The basis for this assertion can be found in the prevalence with which energy supply challenges are treated as principally a matter of technology development. It’s a widely held assumption that our present high-energy throughput civilisation is predominantly a consequence of human ingenuity, and in particular that it follows directly from the rise of scientific knowledge in post-Enlightenment Europe. In this view, we’ve attained our present level of technological sophistication as a result of developments in human know-how and culture that allowed us to unlock the enormous energy surplus available from exploiting fossil fuels. Clearly human ingenuity plays a central role in the story, regardless of how we tell it. It’s equally apparent though—as I hope the historical account presented in the previous three posts went some way to demonstrating—that the development of industrial society did not proceed on the basis of a quest founded on a high-energy future vision, with fossil fuels just being the vehicle of choice for pursuing this at the time. This historical record tells a much more prosaic story, in which the local availability of windfall resources initially played a central role. I suggest that there’s a much more compelling (though not nearly as romantic) account in which fortuitous circumstance led to a situation in which certain populations gradually came to benefit from using fuels that happened to enable order-of-magnitude greater surpluses in terms of the energy that they made available, compared with those that they replaced. The more convincing story is one in which adaptive technological developments unfolded in the context of—and in response to—realisation of a resource windfall, rather than a resource windfall being created through technological developments. This is critically important in our present situation. As we move from the abundance to the scarcity phase of the fossil-fuel age, technological ingenuity can certainly allow us to derive more utility per unit than we have in the past from remaining resources, and to harness non-fossil energy sources for our benefit. What it can not do though, is change the underlying physical nature of the sources available to us. Energy technologies are conversion technologies, not production technologies. Their principal role is in converting energy associated with natural resources from the form in which we find them, to forms that are useful for human purposes. A key trend characterising the transition from abundance to scarcity is the overall shift to more diffuse energy sources—sources for which the associated energy is less concentrated than those with which current energy use expectations have evolved. Technological developments can be brought to bear in aggregating sources and further concentrating the energy associated with them—but this always comes at an energetic cost. Beyond the highly speculative hope placed on fusion energy, the options available to us do not make available to us energy sources equivalent in concentration to those that have fueled industrial civilisation’s evolution. To be clear, energy concentration is not a definitive basis on which to compare the prospects of different sources, and in fact for the diverse physical phenomena with which the energy that we use is associated, energy concentration has multiple interpretations and is not necessarily directly comparable. This is particularly so where we’re comparing stock-based sources (fossil fuels, uranium) with flow-based sources (wind, solar radiation). Nonetheless, it is a critical consideration with which we need to come to terms in assessing the prospects for any energy supply proposal. Being careful with the distinction between energy use and “energy production” may go some way to ensuring that the important considerations related to this are better appreciated as we attempt to navigate these murky and hazard-filled waters. Let’s now move on to look a little more closely at the IEA’s use of the term energy in the specific context we’re considering i.e. in relation to global supply and use. Is the “energy” being considered here the same thing that we’ve been discussing since Beyond this Brief Anomaly kicked off? At first glance this seems to be the case, but the situation is actually more subtle. While the quantities being aggregated are specified in terms of their equivalent heating values, it is actually energy sources that the IEA is aggregating. That is, we’re being presented with an aggregate view of all the raw materials from which the global economy’s energy is derived. It’s not joules of energy that are produced from coal mines or oil wells, it is tonnes of coal or barrels of oil. It’s only when those tonnes of coal or barrels of oil are burnt under carefully controlled conditions—i.e. when those resources are considered in the context of appropriate systems—that we can say that there is a given quantity of thermal energy associated with them. In this respect, the figures presented by the IEA represent an extreme level of conceptual abstraction—the conceptual entity of energy is used as the basis for establishing equivalence between resources that in myriad qualitative and quantitative respects are very different in nature. As just one very obvious example, consider that the IEA table aggregates materials that, in their raw forms, include solids, liquids and gases, and that as such, the various sources are not equivalent in the sense of being readily substitutable within the context of a given economic system. There is certainly scope for substitution, but this requires appropriate capital investment and changes in infrastructure and institutions. With all this in mind, world energy production would perhaps be expressed more accurately as maximum available thermal energy (lower heating value basis) associated with world energy resource production. This is obviously rather unwieldy, and shorthand conventions have an important place in streamlining communication. Even so, while specialists who deal with this on a day-to-day basis know what it means, the established conventions do little to assist the vast majority of people in readily interpreting such important data. There seems to be much merit in remaining aware of the relationship between the terminology we use in this area and the ways that most of us make sense of energy matters. We’ll look at this question of the equivalence between energy sources in much more detail as we proceed, particularly in relation to what it is that the sources actually enable, in terms of doing useful work and transferring heat. There are two dimensions to this, that we might call the engineering view and the economic view (though unfortunately, rarely the economist’s view). The engineering view relates to the thermodynamic concept of availability (popularised more recently as exergy analysis); we briefly met the basic idea with which this is related toward the end of the last post, where I discussed the concept of available energy. The economic view relates to the concept of energy return on energy invested (EROI), and the related concept of net energy. This analytical approach involves assessment of the surplus energy made available by energy supply-related economic activity, for all other non-energy-supply-related economic purposes. Taken together, these two analytical approaches can be regarded as an attempt to provide a quantitative view of the economic potential for a given energy source regime, specifically in energy terms. They are critically important parts of the puzzle for our inquiry here, unfortunately distinguished by their omission from most economist’s views—such as that found at the IEA, and as we’ll see in the coming weeks, within the Australian Government’s energy resource bureaus also—despite their significance for coming to terms with the future prospects for our global industrial economy itself and the ways of life it supports. Before moving on to the next of our three headline quantities, I’ll highlight one more entailment of the general approach to presenting aggregated data that we’re examining here. On the basis of our extensive background discussion on the nature of the energy concept, this matter will hopefully now be obvious, but it bears emphasising. I’m referring to the fallacy of interpreting data such as that presented in the IEA’s table as implying that the various aggregated sources contain energy as some sort of inherent or essential substance-like entity that can be recovered from the raw materials in a refined form. In this sense, energy resources are of an entirely different nature to other mineral resources. Whereas, for example, copper ore can be usefully considered a source of copper, in the sense of containing real material components that may be extracted in the form of refined copper, the same does not apply to our treatment of, for instance, coal, crude oil or natural gas as energy sources. While we often hear that, for example, coal contains a given quantity of energy, as we saw earlier this is simply shorthand for saying that a given quantity of coal introduced into a suitable apparatus and burnt under controlled conditions will result in the transfer of a certain quantity of heat to the apparatus. The importance of keeping this in mind will become more apparent when we look at fuels a little further down the track, but its origins can be found here in the data on the sources from which these are derived. As noted earlier, I’ll discuss the basis for establishing the heating value of fuels in a later post, with a specific view to drawing out the systemic basis for what we refer to colloquially as energy content. You may have noted that total primary energy supply (TPES) and total energy production are within about one percent of each other, with total production marginally higher than TPES. The difference between these quantities is due to: i) differences between exports and imports—presumably reflecting that within the accounting period, some exports are still effectively in transit, and so have not yet been recorded as imports; and ii) changes in storage levels of stockpiles. In other words, there’s a slight difference between the total quantity of energy resources that are produced, and the total quantity that are utilised in the global economy, over a given period of time. For most intents and purposes here at Beyond this Brief Anomaly, we can treat these quantities as analogous. Relative changes in the difference between the two can act as a high-level indicator of what is happening in the global economy with respect to the relationship between energy resource supply and demand. Even so, it is far more useful to consider this relationship for specific energy resources, rather than for aggregate supply across sources that are not directly substitutable with one another. The difference between TPES and total final consumption (TFC) mainly reflects the losses associated with the conversion of primary energy resources to fuels and electricity. Very roughly speaking, it’s the difference between the raw inputs to the global economy’s energy supply sub-system, and the outputs from this sub-system to the rest of the global economic system. So TFC is a measure of the energy associated with the electricity, fuels and heat that “crosses the fence” of power stations, oil refineries and other related industrial facilities, and that is purchased by customers for all other uses. There is one significant exception to this, listed in the IEA table as “Non-Energy Use”. This accounts for the fact that some of the raw materials that make up our primary energy sources are also the raw inputs for manufacturing of non-energy products. This non-energy use component accounts for around nine percent of TFC, with two thirds of this, or six percent, comprising feedstocks for petrochemical plants—the inputs for manufacturing of products such as plastics, chemicals and lubricants. Sankey diagrams are a good way to visualise this relationship between TPES and TFC. I haven’t been able to locate a diagram for the world energy supply situation [10-9-13: clearly I didn’t look hard enough, the IEA provides excellent data in this format here], but an equivalent diagram from Energy in Australia 2012, a publication from the Australian Government’s Bureau of Resources and Energy Economics, provides a good illustration of what this looks like for the Australian context. The figure below shows the relationship between TPES and TFC for Australia in 2011, with TFC represented by the orange box at the right of the diagram. The relationship between TPES and TFC for Australia in 2011. 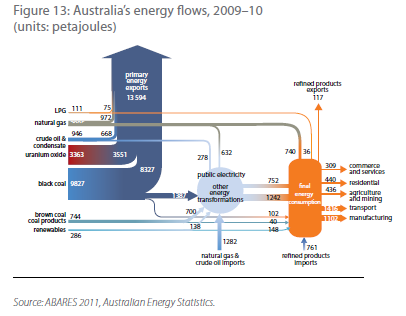 Image source: Energy in Australia 2012, p. 15, accessed 1 May 2012 at http://www.bree.gov.au/documents/publications/energy/energy-in-australia-2012.pdf. Based on the IEA figures, global aggregate TFC amounts to a little under seventy percent of TPES. So what has happened to the other thirty percent? This is essentially the direct cost, in energy terms, of producing refined fuels and electricity. All of the material transformations and energy conversions entailed by these production processes have energy costs i.e. they result in some portion of the energy input being dispersed to the refinery and electricity generation plant surrounds as waste heat. Some of the waste heat can be recovered and sold on (typically in the form of hot water or steam) for use in industrial and residential applications, but most simply becomes unavailable for further use. A good chunk of the total amount of “lost” energy is accounted for by thermal generation of electricity; and the bulk of that amount is accounted for by coal-fired generation. This is not simply a matter of “low efficiency”, in the popular sense of “wasteful practices” or “poor design”. As we learned two weeks ago, the basic principle of operation for all heat engines entails that, for all conversions of heat to work, a requisite quantity of heat must be dispersed to the engine’s environment. The best performance that any real heat engine can achieve is to converge on the maximum possible efficiency for a given set of operating conditions (though practical constraints mean that the performance of most engines is significantly lower than the theoretical maximum). The end result of this is that a significant proportion of the thirty percent difference between TPES and TFC results from the fact that the energy associated with our major sources is most readily accessed by burning those sources to provide heat, while it is actually mechanical and electrical energy that is most useful to us. Our willingness to pay the associated energy overhead cost reflects the value that we place on this utility. It may be worth considering again the point made in relation to “energy production”, with respect to the convention of describing energy use in terms of consumption. The idea of consumption is quite appropriate in relation to fuels and electricity: when we use them, we do indeed consume them. Electricity and fuels can be “used up”, whereas the energy associated with them is simply converted from the form in which it is supplied—electrical energy and chemical energy respectively—to other forms. For instance, the electrical energy associated with the physical phenomenon of alternating current electricity might be converted to mechanical energy (and some “waste” thermal energy) by motors, or electromagnetic energy (and “waste” thermal energy) by lights. The chemical energy associated with a fuel such as petrol is converted to thermal energy and then to mechanical energy by a spark-ignition internal combustion engine; in the process, the fuel’s material components are combined with oxygen in air to form products of combustion, along with associated by-products i.e. the fuel itself is consumed. This is an appropriate place to wrap up for now. Next week, I’ll take up the story by breaking those aggregate figures apart and looking at the principal components of which they’re comprised. Over the next couple of posts, we’ll work our way towards considering the connection between our energy sources and the activity that they enable. We’ll approach that question by looking at the relationship between energy sources, and the quantity of useful work, heating and lighting that they can make available to us. This is where we’ll deal in more detail with concepts introduced in this post such as heating values and availability, and we’ll also start to discuss energy return on investment further, though this will become a larger topic in its own right down the track. Along the way, we’ll look at another important distinction: that between the amount of energy used, and the rate at which we use it, i.e. we’ll start to think about the relationship between energy and power. Based on the ground covered in this post, I’ve now set up a quick reference page dedicated to “units and definitions”. On that page I’ll provide details of all the units and prefix multipliers that we encounter; I’ll also provide brief definitions of some of the key energy-related concepts that are being introduced along the way, as well as handy values such as heating values for various energy sources. Note 1: 2009 is the year for which the most recent data is available at the time of writing. If this has been updated in the intervening period, then the figures provided here will be different to those available at the linked IEA page. This entry was posted in Global energy supply and use and tagged energy production, energy use, heating value, total final consumption, total primary energy supply by Josh Floyd. Bookmark the permalink.